The title of Joan D Vinge’s first novel, The Outcasts of Heaven Belt (1978), is an homage to The Outcasts of Poker Flat (1869) by the turn of the century western writer and poet Bret Harte. He is famous for his depictions of resourceful women in California pioneer settlements. Vinge creates a resourceful female captain of a powerful but weaponless spaceship who finds herself beset – with only a depleted crew – by a series of challenges in the decadent, grasping, and fractured pioneer societies of Heaven Belt. Although the often less than amicable conflict between the egalitarian society with powerful women and the male-focused pioneer cultures could be the focus of the novel, Vinge is less interested in exploring the social ramifications (à la Le Guin and other works of the previous decade – the 1960s). Instead, this conflict provides a suitable world-building backdrop for a traditional space opera – a bedraggled but technologically sophisticated spaceship beset by numerous factions which wish to take it by force. Vinge is at her best evoking the decadent world of Heaven Belt but her attempts to create convincing characters/motivations/tension is less sophisticated. 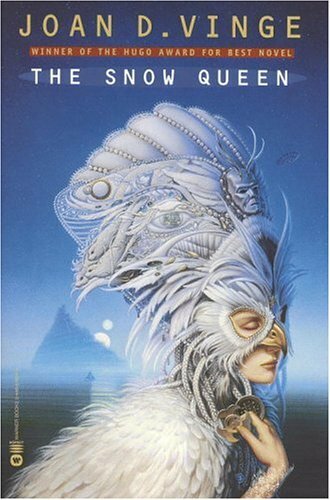 The Outcasts of Heaven Belt is an uneven but readable first effort – masterpieces such as the Hugo-winning The Snow Queen (1980) and Hugo-nominated The Summer Queen (1991) were to follow. In the far future pioneers from earth, after a nameless period of political upheaval, settled less than perfect astroid belts and planets of the galaxy. Heaven Belt, a series of astroids, is considered by the settlements on marginal planets nearer to earth as an utopian expanse replete with natural resources. Betha, the captain of the Ranger and her crew (her husbands and wives), set out from Morningside to settle in the Heaven Belt. Little do they know that the region was previous beset by a devastating civil war. The few remaning survivors huddle in the wreckage of the astroid settlements with dilapidated ships, failing technology, and severe radiation poisoning which creates stratified societies dependent on preserving the few remaining fertile women. The Ranger is immediately attacked by the Ringers. Most of the crew (Betha’s family) is killed. Soon afterwards they gain new members – Shadow Jack and Bird Alyn, young pirates of the crumbling Lansing settlement who attempt to capture the vessel. Eventually they come into contact with the Demarchy, a “pure democracy”. This society utilizes the remaining communication network surviving from the civil war to voice the opinions of all Demarchs. Swarms of newspeople follow everyone around but charisma and show dominate the politics. Ideas are seldom discussed in length before they are immediately voted on. I was intrigued by Vinge’s discussion of this unusual political environment. In short, each society is in an advanced state of collapse. They are no longer self-sufficient and depend on each other for necessities (water, etc). However, the crumbling wrecks of spaceships prevent efficient trade. The inhabitants of Lansing astroid huddle under their tent canopy. Those who are not plagued by deformities caused by radiation stay underground while the deformed tend the remaining gardens on the surface and are prevented from marrying or producing children. The Demarchy proclaims to follow the rule of the people but in reality, the intensely charismatic and the news agencies are the real political motivators. Other astroid settlements are blessed with ice and supply the rest with water but choose their customers, effectively killing their rivals. For each society capturing Betha’s spaceship with its production facilities is a tangible way to emerge triumphant from the wreckage of the war. The societies Vinge creates are vividly realized. Unfortunately, the novel contains little tension. Despite numerous attempts to capture Betha’s vessel, the decayed state of the societies encountered cannot challenge the vessel even without weapons and a limited crew. Also, Vinge frequently resorts to ineffective melodramatic moments replete with clichéd prose (“there are more stars in the galaxy than there are droplets of water in the Boreal Sea”) and stilted poetry (“Understanding comes from learning / no one ever changed a world”). Betha’s clan-based society which defines who is allowed to marry who, modeled on Native American cultures (Vinge was educated as an anthropologist), is too obviously “perfect” and “utopian”. Why would anyone leave to settle a bunch of asteroids out in the wilds of space? The world of Heaven Belt is admirably realized setting the stage for a moving work of space opera. However, the parts do not combine effectively. It lacks emotional depth and effective characterization. An intriguing first novel by an author finding her footing. I suggest tracking down her 80s and early 90s classics first.